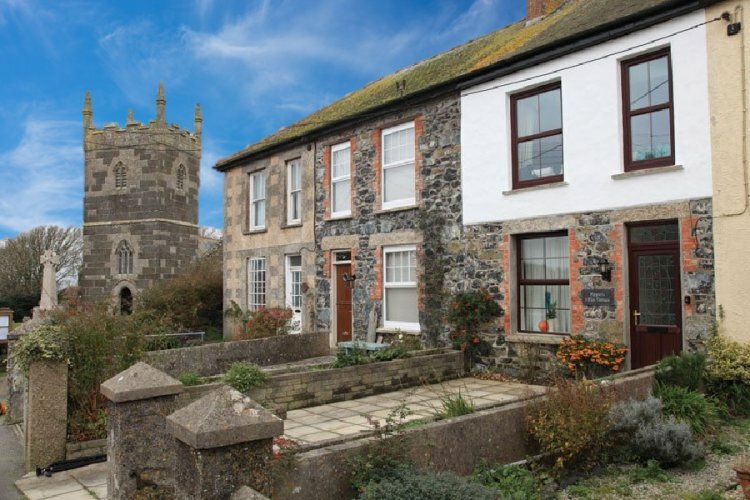 'Pippins' is a three bedroom mid-terraced cottage in the heart of Mullion on the Lizard Peninsula. Sleeping up to four across the three bedrooms, with driveway parking and an extremely convenient position for all the village amenities including a choice of pubs, convenience stores, pharmacy, fish & chip shop and an Ann's Pasties outlet. The sandy beaches at Poldhu & Polurrian Coves are both within one mile and the harbour at Mullion cove is just over a mile away. Entered into the hallway from the driveway parking space. The large lounge/diner has wood flooring, comfortable seating for four people, there's a flat screen TV with Freeview over the ornamental fireplace and a dining table to seat four. The kitchen is well-equipped with an electric oven with 4-ring hob, fridge/freezer, dishwasher and a microwave, kettle and toaster. A door leads to the rear open courtyard with small patio and bistro table with two chairs. Upstairs are the three bedrooms and bathroom. Bedroom one is a king-size room with 5' bed, bedside tables and lamps, triple wardrobe, an ornamental fireplace and a window seat. Bedroom two is a double room with 4'6" bed, bedside tables with lamps and a triple wardrobe. The third bedroom is a single room with 3' single bed and an all-in-one storage unit. The bathroom is fully tiled with an electric shower over the bath, handbasin and a heated towel rail as well as a cupboard that houses the washing machine and tumble dryer. There is a separate toilet. Outside to the rear is a courtyard and access lane for adjoining properties, while at the front is a driveway with parking for one vehicle. Heating is by modern electric radiators. Rental includes bedlinen, towels and WiFi. Please note, although there are enough beds to sleep 5, the property accommodates 4 persons only and the additional bed is just to offer more flexible sleeping arrangements.